Nothing quite gives creativity a sense of purpose like a desk to call your own and it’s the same for children. Lucky for us, there is an uber stylish new table and chair on the market which very much has me wishing it came in a matching full size for adults. Click on through to find out more about this dual purpose beauty! No doubt about it, present your toddler or preschooler with a desk, especially one built with their size in mind and watch the colouring, writing, drawing and construction flow. Plan Toys is synonymous with quality so we can confidently assert that this new Plan Toys Table and Chair set will stand up to whatever creative play your toddler throws at it. 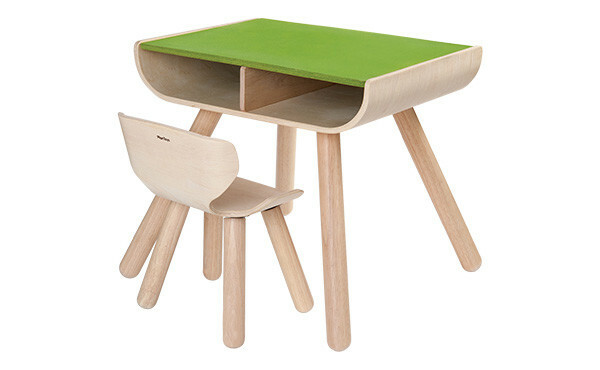 The contemporary bent wood styling is set to complement modern interiors and the pop of green in the desk’s top is more than just that – it moonlights as a chalk board for some serious double duty fun. Two large storage pods are perfect for neatly storing paper, random crayons and of course toy cars and garden found treasures such as rock ‘paper weights’. The coordinating chair is a sweet addition and is curved for comfort, excellent for seating little artistic bodies. There’s no word yet as to this piece being stocked locally, though we think it’s only a matter of time and we’ll be sure to let you know when an Australian stockist is locked in – and fingers crossed it’s in time for Christmas shopping! 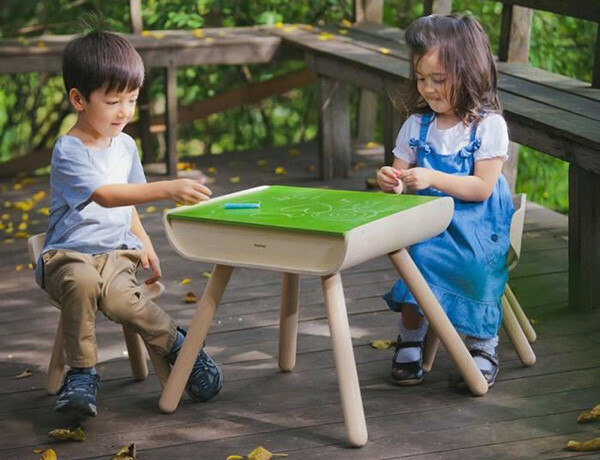 For those not wanting to wait, you can purchase the Plan Toys Table and Chair set for US$121, with shipping to Australia extra, from YoYo.com.